How to Keep New Skates Rolling for Years to Come! Purchasing roller skates is an investment that you’ll want to maintain. The International Sports, Skating & Fun Centre in Cherry Hill is happy to offer these maintenance tips to keep your skates operating in top form for years to come. If you purchased quads, check to make sure the toe stop is adjusted to the correct or preferred height. Make sure the wheels are properly attached with the nut in the wheel firmly screwed in. There should not be any give between wheel nut and wheel. The place between the wheels on quads is called the truck. You’ll want to check the tightness of the truck and tighten that bolt as well. Make sure the wheels of your roller skates have not become loose; tighten them if they have. A loose ride is a dangerous ride, so keeping your wheels tight is important. Bearings must be dry. 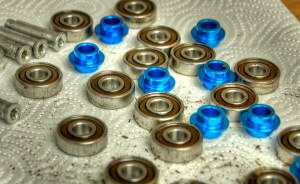 Wet bearings will rust or corrode. Grime or rust can be removed with rubbing alcohol; do not use dish soap as it will damage your bearings. If you notice that your ride is less smooth, it is time to check the wheel bearings. Some skate dealers have wheel presses that will remove the bearings, but you can also use a screw driver. If your roller skate bearings don’t spin well, they need to be lubricated. Smell can be eliminated with fresh air and sunlight. Leave the insoles of your skates fully exposed to the sun to remove odor. Baking soda may also prove a viable remedy. If you take the time to care for your roller skates, they will last for years and be smooth riding for a long time. If you invest the time into roller skate maintenance, you won’t have to invest the money into a new pair of skates. Share your tips and tricks for roller skate maintenance at our ISC Cherry Hill Facebook page.